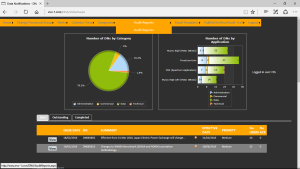 The Data Notifications Analyser (DNA) was designed and created for the Evo-1 Alliance to automate the distribution of Vendor Data Notifications (DN’s) to relevant stakeholders including Applications owners and Data Users alike. These DN’s relate to data that have an imminent date for various types of change. Missing that Data Notification or not making the necessary change prior to the target date could have serious consequences on the business and adversely impact data users not only by misinformation causing missed opportunities, there is also a risk of financial consequences for noncompliance or unforeseen costs if a much used data set across the trading floor, becomes fee liable at short notice. DNA provides every Data Notification with all the relevant information, including the DN’s listing, the instruments affected target dates, and every conceivable type of report to provide the status including those DNss which have not been acted upon. Every DN is all in one place regardless of vendor and a role based dashboard reduces the burden on the market data administrative team and provides an auditable workflow. Simple to use with easy-view Dashboards eliminating the ‘Fog’ in today’s multi-directional manual processing. DNA provides transparency of effort expended, communication logs for community review, plus time & status to target. Bespoke streamlined workflow adds relevance to ownership; hierarchical accountabilities bring reduced exposure to operational risks. DNA mitigates the likelihood of system outages and their associated characteristic financial impacts. DNA identifies the instruments impacted by each change notification and automatically routes these to impacted users and applications. Fits with your current DN’s process.